Continuity mistake: When the bobsled team is getting their act together in Calgary, there's a scene of them pushing off with an unpainted bobsled. In the shots of the feet of the guys pushing at the back of the sled, you can see that the lower back of the sled is painted black with green stripes, the colours that they paint the sled in a scene a few minutes later. 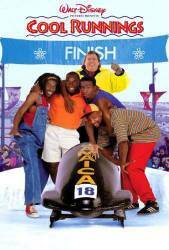 Continuity mistake: In the final race Blitzer talks to Sanka and at the time he has his goggles on top of his helmet. After he turns around and his goggles are on his helmet. Continuity mistake: In the film you see John Candy at the top of the Calgary Tower having Lunch. In the background you see a building called Bankers Hall which is slightly higher than the Calgary tower, that's fine except this was the 1988 Olympics, that building wasn't completed until late 1990. Continuity mistake: In Jamaica, when they are practicing with the roughly thrown together bobsled on the dirt road, right after they swerve to avoid the lady on the road and right before the bobsled crashes into the police vehicle, they are going over the rough terrain and the bobsled's front wheel (left side to the viewer) flies off in front of the bobsled from the left side of the screen to the right, but in subsequent shots of the bobsled the wheel is always there. Visible crew/equipment: When Mr. Coolidge shuts off his TV after Jamaica's first bobsled run, a stage light is reflected in the TV screen.